Should QA do any validation at install? Validation of the QuBAS installation is not required. Any validation records that were created would be completely superseded at every analysis, so there is no need to do it. What about QA for upgrades? The same applies – just download and use. Quantics ensures that every upgrade will produce the same results when run on historic data sets by a) only updating one half of the DSCP at a time, and b) automated testing on more than 2000 data sets every day. The update process provides an option to automatically check the new version against your old data for added peace of mind if you wish. 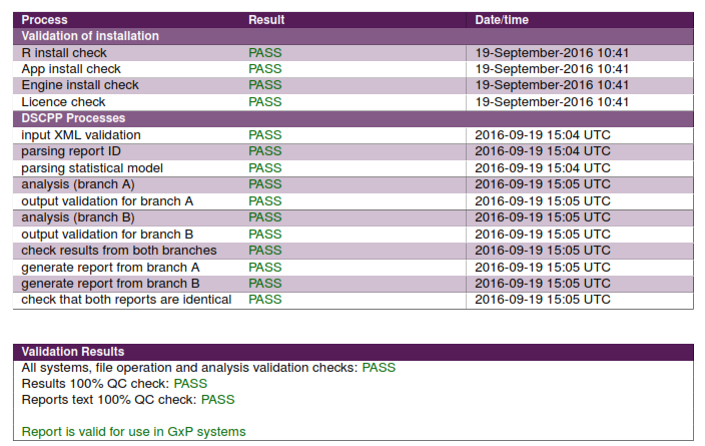 How will QA know that the real-time validation has passed? The final page of every report is the audit report and contains details of the validation and other aspects of audit. Is it a cloud based system? No. It is designed to run over your company’s internal network. It can also be installed on a stand alone PC. What about QC of results? Every calculation is automatically QCd by the DSCPP process. No further QC is required. Is the system compliant with requirements of 21 CFR part 11? Yes. QuBAS can be used as a part of a 21 CFR part 11 compliant system. How do Regulators view this disruptive new technology? The CrtV processes incorporated into the QuBAS software have been used for several years in-house at Quantics for GxP regulatory work. Quantics is a member of the MHRA GLP scheme and as such is regularly inspected by the MHRA. At every inspection the MHRA have fully approved the Continuous real time Validation (CrtV) process, and agreed that traditional validation processes are not required. One inspector described the system as “innovative and elegant” (and was happy to be quoted). The processes have also been audited with no adverse findings by numerous clients for GxP work, The MHRA have told us that anyone with concerns can write to GLP@MHRA.gsi.gov.uk. Quantics have been invited by the MHRA to a meeting of GLP and GMP inspectors to explain the CrtV process, so that inspectors know what to expect when they audit companies using QuBAS. If you would like a question answering that isn’t answered below we would love to hear from you.